The Birds of a Feather Kickstarter is right around the corner (March 10th! ), so I decided it’s time to share some stories from the game’s development. If you haven’t already checked out the free print and play, you might want to do that before diving into some of the details below. 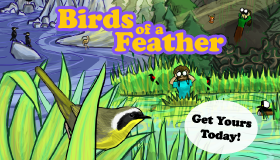 Birds of a Feather is different from my previous games in many ways, most significantly because it’s very simple. It has a few core rules, but almost no special rules or exceptions. The rules fit on the front and back of a single sheet of paper with plenty of room for diagrams. This made the entire design process for the game very different from the other games. 1. Tweaking numbers. The game originally had 6 habitats, each with 5 birds, and ended with 5 habitats, each with 7 birds. It took about a month and a half to add the 6th bird, then another month to drop the 6th habitat. After that, it took 8 whole months to add the 7th bird to each habitat. The raptor special rule is the only one to make it into the final game. 2. Throwing out special abilities. I came up with the raptor special rule when I originally conceived of the game, and it survives to this day. That may be the only unique card power that made the final game, but that doesn’t mean I didn’t try others. Unfortunately, none of them improved the game. In fact, they all detracted from the game, either slowing it down, confusing players, or disrupting the core gameplay. In the end I decided to keep things simple and include only the single special ability, which adds just enough spice without overpowering the main experience. Though design itself was fairly straight forward, other aspects of development were shockingly difficult. It might just be that, because the game has so few moving parts, everything felt like it had to be perfect. In any case, here are a few of those issues we had to solve for Birds of a Feather. I know that some designers start with a name, usually a pun, and then build a game around it. Not me. I usually start with a core mechanic and/or a rough idea for a theme. What I’ll call the final game is the last thing on my mind. Still, at some point you have to buckle down and choose a name… and I dread that time. Birds of a Feather seems like a perfect name in retrospect, but it took a long time to get there. Early on I called the game Birder, since that’s what you are in the game, but I knew this wouldn’t last–few people know the term “birder”, and it sounds too much like “burger”. It’s also missing a certain ring or cleverness that you always want in a name. So, the team and I brainstormed as many bird related names as we could. We even reached out to the internet and asked people for suggestions on facebook. That generated a long list of great ideas, but most of them wouldn’t work for one reason or another: already taken, too long, too much of an inside joke, etc. In the end we decided that Twitcher was the best option. What, you don’t know what “twitcher” means? It turns out you’re not alone. If few people know what “birding” means, far fewer know what “twitching” is. (In case you were wondering, it’s British slang for traveling to see a rare bird someone else reported… exactly what you do in Birds of a Feather.) Not only were people confused by the word, it brought up very negative connotations for many people, probably because it sounds so much like “tweeker”. So we had to scrap the idea and were back to the drawing board. We played with many possibilities, going back to our long list, never quite satisfied with anything. For a while we even considered Avian Odyssey, because I guess we wanted to sound as ridiculous as possible. In the end, I decided on Birds of a Feather, even over protests from some members of the team. It was a tough decision, but I’m really glad we spent the time considering the name. It’s the first impression many people people have of the game; it’s something players say repeatedly; and it needs to capture both the spirit and experience of the game. Birds of a Feather was hard to discover and agree on, but I think we made the right decision. When people hear that you need a score sheet to play Birds of a Feather, their initial reaction is often “this is more complicated than it should be”. But the score sheets are actually very easy to use! I’ve played with young children who have no trouble filling theirs out correctly. Part of what makes them easy is that all of the habitats follow the same pattern. We decided on this structure early on, and it’s worked great. But there has always been one problem–it isn’t clear how best to represent the birds with symbols. Birds of the same rarity in different habitats can be radically different, so there is no obvious way to visually represent them all. To make matters worse, most of the birds have unique characteristics, but three in each habitat have the exact same stats. That means that whatever symbols we use to represent the birds, those three must be different but equal. 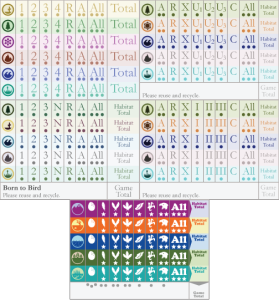 A few iterations of the score sheets show some of the different symbol systems we tried. Originally, we just used numbers for the different birds, but that clearly implies a hierarchy. It’s also awkward since the birds have other numbers associated with them, like number of points. We next tried arbitrary letters, but people always tried to guess what they stood for. So we tried representational letters, like ‘C’ for “common”. But this proved to be problematic for the “uncommons” (the three identical birds), and we also couldn’t figure out how to distinguish the “rares” from the “raptors”. We tried combinations of letters and numbers, using roman numerals or greek letters, even simple geometric shapes, but nothing felt right. So we tried icons. But which icons? 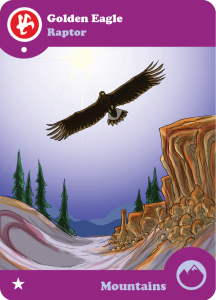 Obviously, we wanted them to be thematic, but coming up with seven different bird related images that aren’t species specific is more challenging than you might think. We considered many options, from different bird body parts, to nests, to music notes, to binoculars, but couldn’t quite figure out what would work best. And to be honest, we still haven’t! I feel that the icons you see now are close, but they aren’t quite there yet. By the time all of the art for the cards is finished, we will be there, though. The take away from this story is that every part of a game should be thoroughly tested and iterated. Symbols that seemed obvious and perfect never quite worked the way we expected, so I’m glad we gave ourselves a lot of time to experiment to find a collection that felt just right. We Don’t Need No Stinking Score Sheets! When you’re developing a game, it’s usually best to use the quickest, simplest solution to a problem. So early on, no one had an issue with using score sheets for Birds of a Feather. But as the game matured and we didn’t change the score sheets, people started to get concerned… were we actually going to include something disposable in the game? There was a time when score sheets were a common component for board games, but those days are over. People expect their games to last forever, and score sheets are an unwelcome reminder of our games’ (and our own) mortality. Needless to say, people were not impressed when I told them we were planning on sticking with score sheets. Of course, I had good reasons for staying with score sheets. Mostly, I wanted to keep the game’s price and size down, for me as well as for customers. All of the other solutions people suggested, mostly some form of player mats with bits to mark seen birds or dry erase boards with markers, required many more components and a bulkier box to house them all. If you’ve read my recent article, you know I’m trying to keep the scope and price of my games down as much as possible. But I was starting to realize that people hate score sheets so much that even mentioning that the game has them could drive people away from the Kickstarter. What could we do? I decided to take a risk. We already planned to create a scoring app as a stretch goal for the Kickstarter, but I shifted that up and made it the main way to play the game. 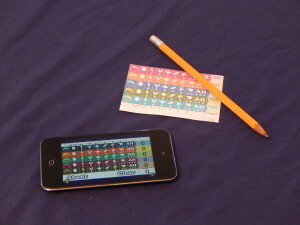 The game will still come with score sheets for people without phones or who prefer to not use them, but the default way to play the game will be with your phone. Will this solve the problem? I honestly don’t know. Apps for tabletop games are only slightly less controversial than score sheets. While I think this is the direction tabletop games are moving (for better or worse), the transition period can be rough, so while I’m proud that Nothing Sacred Games is on the vanguard of non-digital games making use of digital technology, that doesn’t necessarily translate into success. If there’s a take-away from this story, it’s that not all problems have easy, perfect solutions, and you shouldn’t be afraid to try something unusual when all the solutions are messy anyway. 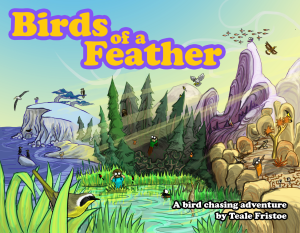 Like all my games to date, designing Birds of a Feather has been a very rewarding experience, but it has followed a very different path and offered very unusual challenges. At the end of the day, having to overcome new obstacles and think about things differently is what makes game design so great! As always, I would like to thank my generous Patrons for helping to make this article possible.